The path to becoming a Musikgarten early childhood music teacher is fast and easy, and we are here to guide and help you at every step. 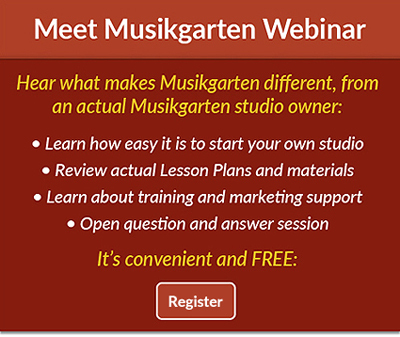 Attend a free, one-hour “Meet Musikgarten” webinar to learn about Musikgarten, becoming a music teacher, and how we work to build strong, ongoing relationships with each of our teachers. Register for teacher training, either in a webinar series or an in-person teacher workshop. Attend a “Getting Started” webinar. This is a free, one-hour business coaching webinar for those who have decided to become a Musikgarten teacher and want detailed advice for building a successful business. This is required for those choosing the webinar series and is highly recommended for those taking a workshop. Attend the teacher training session for the Musikgarten classes that you want to teach. Congratulations! Upon successfully completing your training, you will be eligible to receive a Musikgarten teacher’s license, which lets you begin teaching music to children and building your business right away. Order family packs, secure a classroom location, set music class schedules, and begin marketing your business using the wealth of materials that Musikgarten provides. Once you are certified and licensed, you can teach any of the classes offered in the Musikgarten children's music curriculum. But it doesn’t stop there. You can always take Musikgarten teacher training workshops outside of your current curriculum and use any of the marketing materials we offer to help you build your business, as long as your license is renewed yearly. To find out more about Summer workshops, webinars, discounts, or to register, contact us here.